Another Cisco Live is over, and with some sadness I have packed my bags and headed for home. It’s always a bit of a let down to come home after such an intense week; this year’s Cisco Live was educational, fun, and I made some great personal connections too. So what am I buzzed about this year? Find out after the jump. 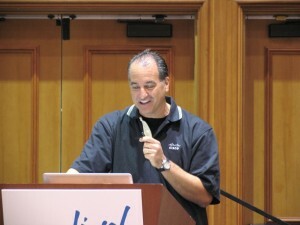 Cisco Live is about so much more than just technology, and this year’s “tag line” of “Learn. Connect. Collaborate. Together” seems very appropriate. Aside from the firehose of technical content at Cisco Live (Learn), it’s also a great opportunity to make new aquaintances (Connect), build relationships and exchange communications with those people going forward (Collaborate) as part of an extended social network. I’m sure that on one level at least Cisco intended for the tagline to refer to the collaboration capabilities of their products, but really it applies very much to the “Human Network” as well, and it’s one key reason to attend Cisco Live. 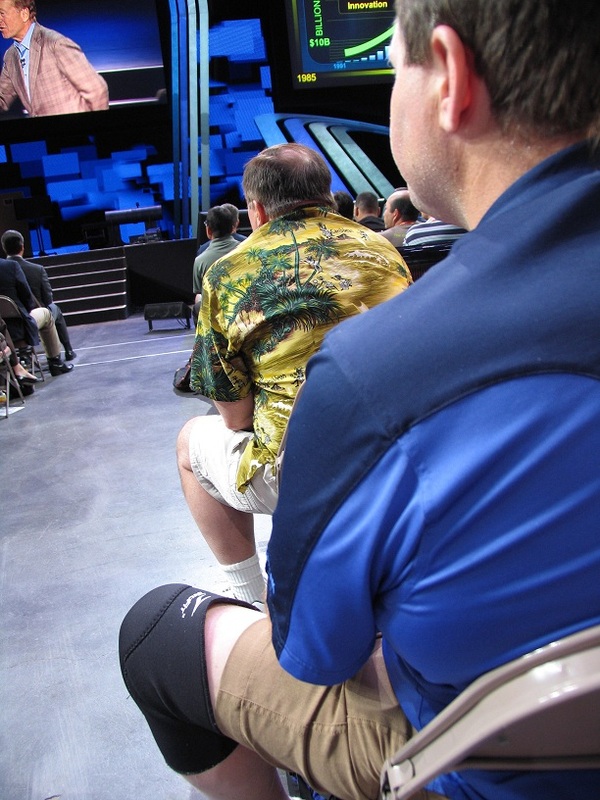 In previous years I’ve attended Cisco Live with work colleagues and ended up spending much of my time with them; this year I spent much of my free time meeting fellow Twitter users – some of whom I followed already, some of whom I follow now! Rather than attend in isolation, the Twitter users tried to sync up regularly – hanging out in the same place each day so there was always a home base to drift towards and see who was there. It was great to put faces to names of people I’ve been exchanging 140-character missives with for the last year, and hopefully they weren’t too disappointed in my own reality. Either way, I met some great people and thoroughly enjoyed this unofficial aspect of the event. Cisco have been supportive of Twitter users, and even sponsored a Tweetup at the Customer Appreciation Event (more on that later). 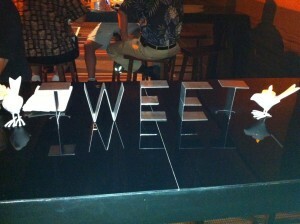 Cisco has been engaged with social media for a while – with Facebook and Twitter accounts for many outlets (e.g. 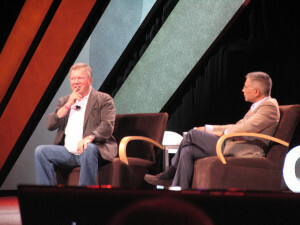 @CiscoLive, @CiscoPress, @CiscoEvents, @CiscoStore and so forth), some of which are particularly active. The @CiscoLive Twitter account as well as some key individuals at Cisco have been very responsive to Twitter users – not just listening, but actually acting on suggestions, finding out answers to questions, and feeding back on concerns. 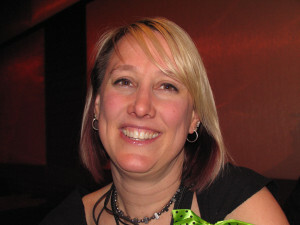 A particular mention is due for Leslie and Kathleen whose interaction on Twitter regarding Cisco Live was truly amazing – it is unusual and refreshing to know that somebody is listening and acting, and is so willing to listen to feedback. The @ ribbon was very helpful – firstly, it identified from a distance that somebody was a Twitter user, and secondly you could figure out who it actually was! It’s said that at Cisco Live men can finally get to experience women’s complaint that people talk to their chest – the first thing most people do is to eyeball at your conference badge with your name and company on it! 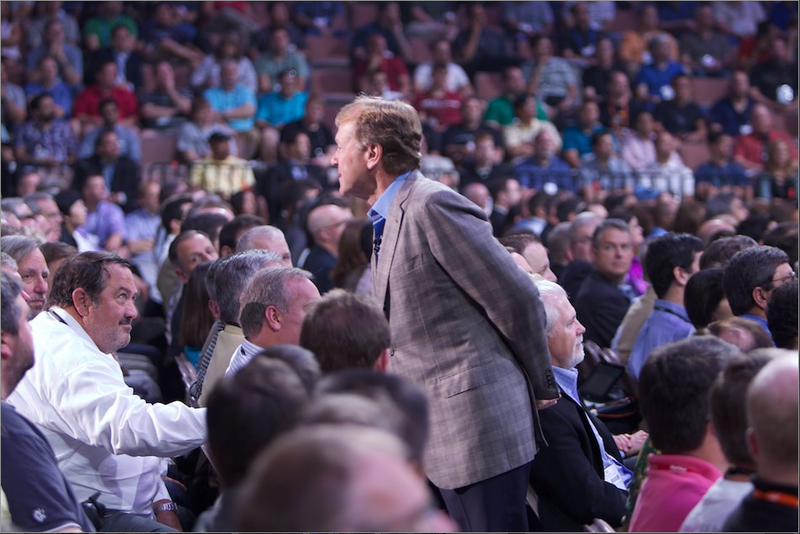 Breakouts are the mainstay of my time at Cisco Live – they are the technical sessions that fill my schedule each day, available for a wide variety of topics. This year I managed to somehow not attend any Mobility sessions (this is unusual for me!) and instead I focused more on Routing/Switching and Data Center technologies like LISP, FabricPath, OTV and IPv6. I was not disappointed. LISP in particular was a hot topic this year, and the content was much deeper and further developed than last year (as you’d expect with a technology that’s do new), and left me much more to think about. FabricPath was also covered in more detail, especially from the perspective of what Cisco brings to the table over and above TRILL – expect a post from me soon summarizing some of those aspects. The advanced breakouts present information that often just isn’t out there in the wild in such a well organized form (if it’s out there at all), and many of the topics are presented by the people writing the protocols or developing the products. If you ever needed an excuse to attend Cisco Live, on a technical basis if nothing else, gaining access to these people should be it. I’ll also add another plug for Cisco Live Virtual and their free 3-month registration – the 12 month registration cost over $500 last year as I recall, so getting access for free is amazing. You get access to all the CiscoLive breakout PowerPoints (in PDF format) as well as on demand replays of the keynotes, and of many of the breakouts (most are audio+slides, some are full video). If you aren’t taking advantage of this offer, as mentioned before, you’re mad! In terms of content, Chambers’ presentation began with something to the effect of “Ok, we screwed up, let’s get back on track“, followed by an outline of the new strategy with five key areas of focus for Cisco, compared to last year’s bullish 30 market adjacencies or however many it was. This same morning, news had broken on the rumor mill that Cisco would be cutting up to 10,000 jobs – unsuprisingly this was not on the agenda for discussion. 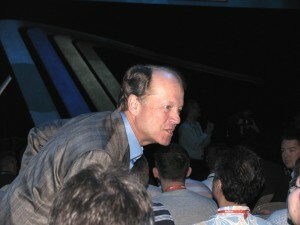 My take on the keynote was that it was absolutely a worthwhile event to attend; on a personal note, my feeling was that John Chambers is just looking tired. Out of curiosity I looked up his birthday, and if I recall correctly he’s 61 now, and will be 62 next month. You have to wonder how much longer he plans to stay as CEO, and whether he’s grooming somebody to take over the reigns. I see Joe Pinto being used a lot as a key player in Chambers’ current “recovery plan”, but whether that has any significance remains to be seen. 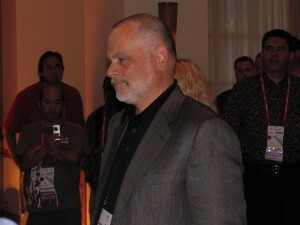 Tuesday afternoon, I found myself with a scheduling conflict – in the timeslot where I should have been attending “BRKRST-2312: An Overview of IPv6 Routing“, I also had an invitation to the CCIE NetVet reception with John Chambers. I decided to catch BRKRST-2312 on Cisco Live Virtual at a later point, and attend the Chambers event instead. 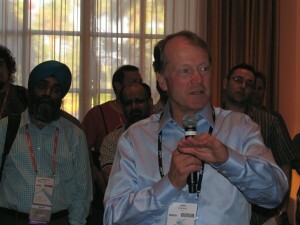 The CCIE/DE NetVet reception is an invite-only event for, as you might guess, NetVets with a CCIE or CCDE certification; probably less than one hundred people in a room with John Chambers (CEO), Joe Pinto (SVP) and others. We arrived at a room in the Four Seasons Hotel (attached to the Mandalay Bay Hotel), and were plied with (great) food and drinks until “Uncle John” (Chambers) was ready to talk. The talk was a very informal session in the round – microphones were in use for audibility purposes, but it was not a presentation. 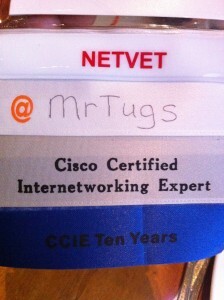 Rather, it was an open an honest Q&A in the round with the CCIE/DE NetVets, no topic off limits. The accepted rule is that what gets discussed in that room does not get shared outside the room; this allows for more frank discussions and responses than could be given to a wider audience, and this is part of the “perk” of getting access to the event. I didn’t ask any questions personally, but it was refreshing to see the responses to the questions being asked, and to the feedback being given – and the immediate connection of people with issues to managers (including SVPs) who could resolve them was impressive.Since I won’t discuss the content, I can’t say any more, but if you are able to get access to this event it’s a huge and very exclusive bonus. 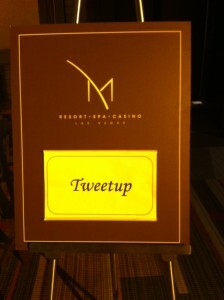 Tuesday night was the CCIE/DE party at Madame Tussauds at the Venetian, another invitation-only event. Conceptually, hosting a party in a wax museum is an awesome idea, but sadly it ended up not quite working out as I suspect was intended. Bad traffic flow – The museum is arranged in a linear fashion; that is, you enter at the top, follow a predetermined path through the museum, down stairs to the lower floor, follow another predetermined path, then exit. That’s the normal visitor flow – but linear flows aren’t how parties typically work. People like to mill around and mingle. Worse, many of the hallways connecting the rooms are only about two people wide – so queues formed quickly in the ‘inward’ direction and you couldn’t really bypass the line as there wasn’t room. Taking photographs – You’re in a wax museum, so naturally people want to take photographs with the models of famous people. That means standing 6 feet back from the model and taking a photograph, thus putting yourself in the way of anybody trying to move on by. It also caused pools of stagnation near room entrances that further backed up the lines in the hallways. Too many people – Simply put, if you halved the number of people there, it would probably have worked. For the second year, the CCIE event allowed us to bring a single guest (who had to have a full conference pass, an Advanced Explorer pass or a social events pass) – this is something that I truly appreciate and want to keep going. However, I got the feeling the event was scoped for the number of CCIEs, not the number of CCIEs plus their guests (which I suspect most people brought). It has been suggested elsewhere that the +1 should be removed, but I disagree. I am very firmly in favor of allowing a guest – but the venue has to be scoped to cope with that number of people. Food couldn’t keep up – With echoes of last year’s Customer Appreciation Event, the food was not available fast enough to keep up with demand. Some of it was being cooked ‘real time’ which is great, but they couldn’t cook it fast enough to feed the guests. This is vastly frustrating. Overall it was a great concept, and I’m told by people that stayed until the event cleared out a bit, that once the number of people there had dropped it was significantly better. For me however it just wasn’t enjoyable, and after 30 minutes or so I and the group I was with left the event and went elsewhere. 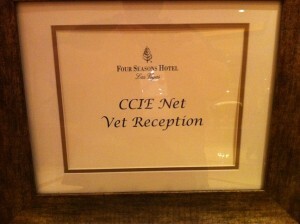 Wednesday night was the Customer Appreciation Event (CAE), held at the M Resort. 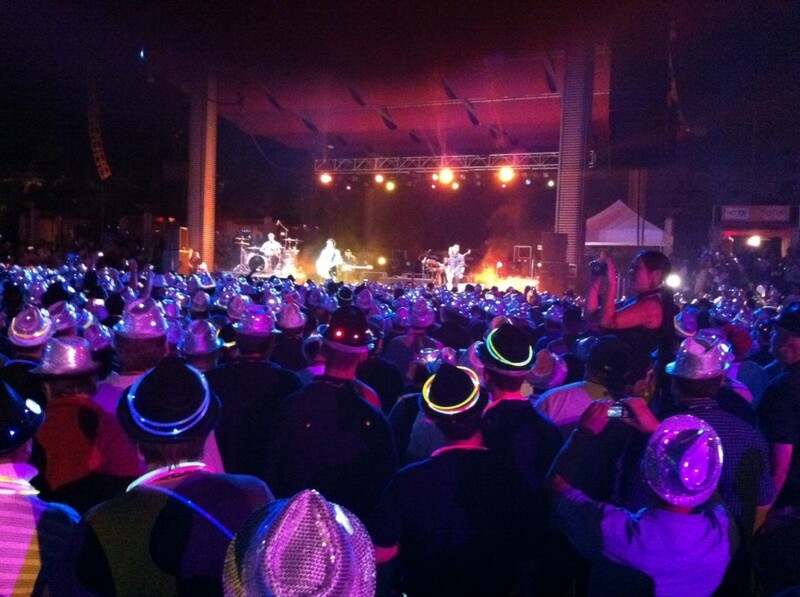 The CAE is seven or eight thousand geeks in one place wearing silly hats and listening to bands. This year’s event featured Ok Go and Train, and was definitely the best CAE I’ve been to in the last four years. 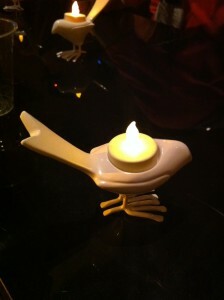 It was simply awesome. 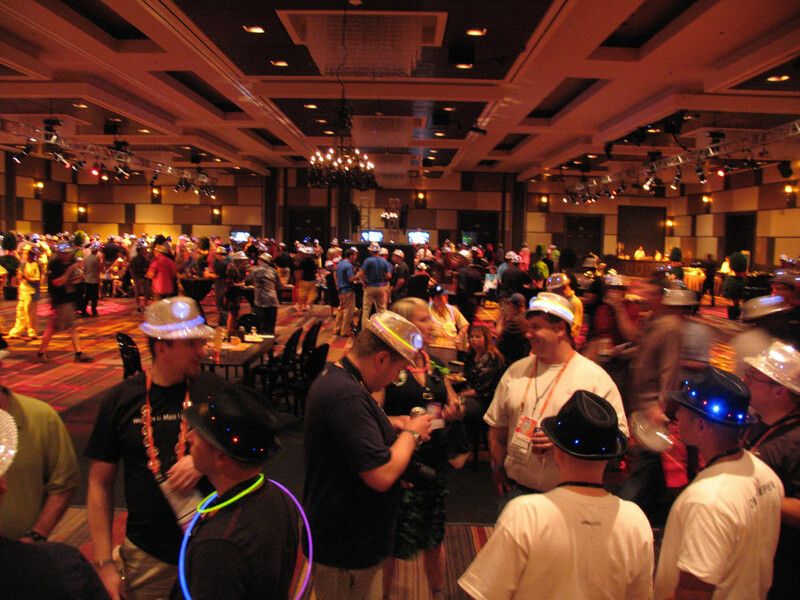 The food was great and readily available, the drink was plentiful, the bands were superb, and there was a range of activities to keep you busy – ranging from XBox360 to DJ Pete Wenz and a Chillout room with a Tweetup area for the Twitter users. This year’s final keynote took a slightly unusual slant; rather than being a prepared speech by the guest (followed perhaps by Q&A), the whole keynote was done in interview format with Carlos Dominguez acting as host (Carlos’ Raw Nerve?). 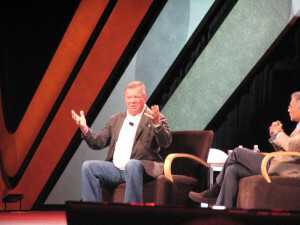 What was apparent to me was that they had not had quite enough time to prepare – Shatner had flown in that morning (hence moving the keynote to the afternoon this year). This, however, simply made it funnier – Shatner’s blissful ignorance of Cisco was hilarious, and he had the entire room falling about with laughter at times. I’ve got a few more things to share, but I’ll save them for another post perhaps – this one is getting too long already. One thing I think it’s important to make clear: you don’t have to be a Cisco fanboy to enjoy Cisco Live. I’m a huge fan of f5 and Juniper in addition to Cisco, but f5 and Juniper don’t have anything like this experience (yet) – I would love to attend a “Juniper Live” event! 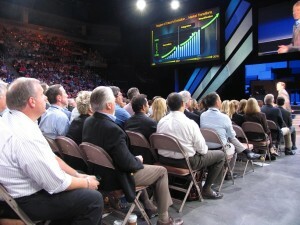 Meanwhile however, the sheer scale of the Cisco Live event makes it something special and unique in the networking industry. 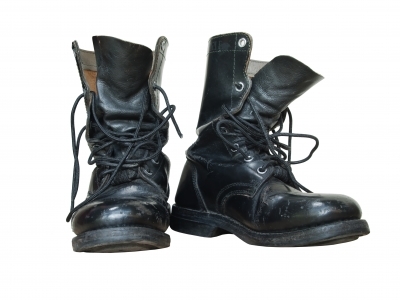 If you work with Cisco products as a customer, reseller, or as an end user (e.g. an engineer), the opportunity to get this close to the source of so much expertise is just phenomenal. Hearing Cisco’s strategy so clearly is incredibly helpful when you’re trying to plot a technology course for your own company. 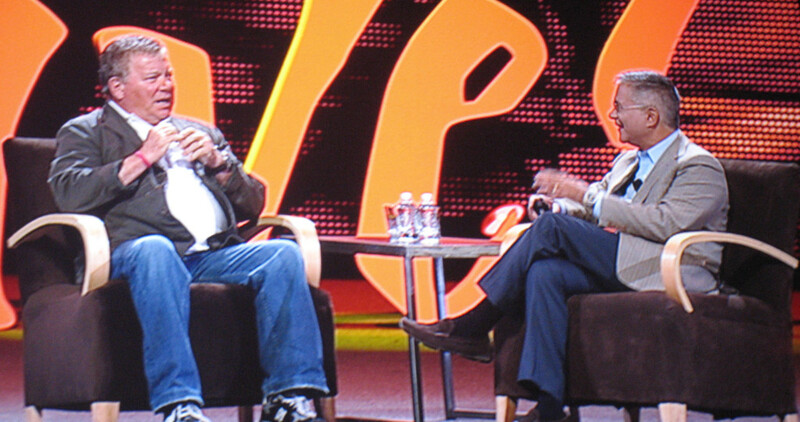 Basically, if you can’t see the ROI for attending Cisco Live, you’re missing something.